In case you’ve been living under a rock for two weeks — or for my non-Columbia friends — here’s what happened: two students have been charged with a hate crime and temporarily suspended for allegedly dropping cotton balls in front of MU’s Black Culture Center. 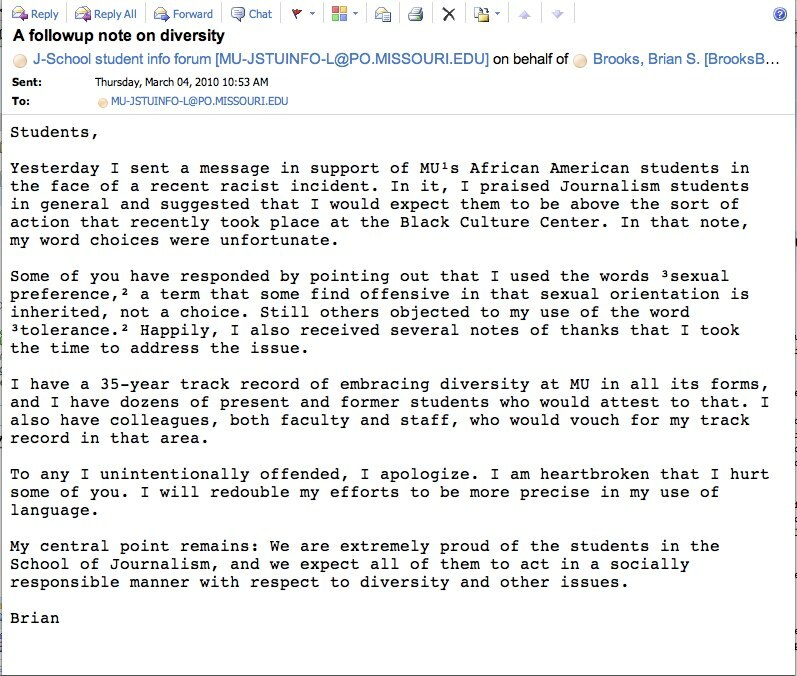 As a response, students got two informative, politically-correct e-mails from MU Chancellor Brady Deaton, and journalism students got this message from Associate Dean of Students Brian Brooks. The message drew the essentially-rightful ire of some students who objected to the pairing of the words “sexual” and “preference” instead of sexual orientation. Brooks issued this apology. Some students didn’t like it either. 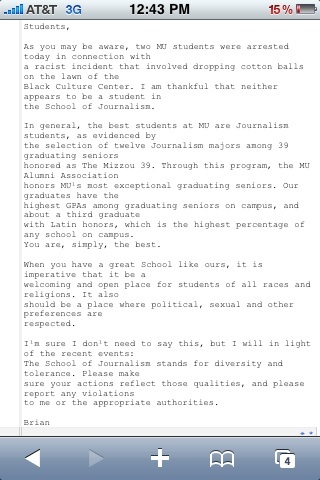 It seems odd that, as an MU Journalism student, I don’t get e-mails from Brian Brooks addressed to the entire MU Journalism School. So, oddly enough, I’m getting all of my information on this secondhand. Even if I had actually received the e-mail myself, I don’t think I would have felt any more strongly about it. In actuality, the e-mail says precious little. So we can turn these few words against Brooks, turn them into a problem, attribute some higher meaning to them, or attach them to vague longstanding issues between students and administration. Or we can read them for what they are and move on. I understand how an e-mail that was probably intended to be Rah! Rah! J-school is being panned as elitist — a legitimate complaint. I also understand the anger at the use of the term “preference” when referring to someone’s gender identity and sexual orientation — again, legitimate, although I’m alarmed at how quickly some have demonized him for the error. But I’m not about to write a blog post about one word or one paragraph of this e-mail. I want to talk about what I wish Brooks had written instead — not because the first e-mail was offensive, but because I think he had more meaningful things to say. I wish Brian Brooks would’ve written about how he cried in my friend’s J2100 after the 2008 election, amazed and overjoyed that after all the racism he saw growing up in the Deep South, he lived to see an African-American elected president. I wish Brooks would’ve written not about how relieved he was that those responsible weren’t journalism students, but instead expanded on the part in which he reminds us that “The School of Journalism…” and its students “…stand for diversity and tolerance.” I wish Brooks would’ve written about the ugly, insidious racism which still obviously haunts our society and this school, and how we as the (quoting the Arch) “bearers of Light” in society must be hell-bent on rooting out this prejudice. Here’s the bottom line: On balance, is Brooks’ e-mail promoting that prejudice? Or is it a call to rise against that prejudice? Of course it’s the latter. Good enough for me. What? A ridiculous dichotomy you say? This cotton ball incident can inspire us to rally together as a community to stand for equality whenever possible, or it can make us stupid angry at each other. And we’ve chosen to get stupid angry. This whole incident — cotton balls, e-mail, everything — requires us to focus on the constructive, and requires perspective. Concerns over elitism or diction are legitimate, but are they substantive enough? I just don’t think so. Check your junk mail. His emails go there for me all the time. Aha! I use Mac Mail, and it didn’t get to my Mac Mail junkmail. But when I checked the online box, sure enough! Thanks.